This year, as City celebrates its 125th anniversary, we reflect on the impact that this institution and its people have had on our local community and the world at large. As part of this celebration, the Archives Group presents its first exhibition: The story of City: life, learning and legacy. The first part of the exhibition runs from January until July, and explores the very earliest days of City, then known as the Northampton Institute. We focus on the foundation of the Institute, early building works and the opening festivities. Another exhibition, coming later this year, will focus on student life at City and the role the Institute played in community life. Many of the archive artifacts in the exhibition are on public display for the very first time. 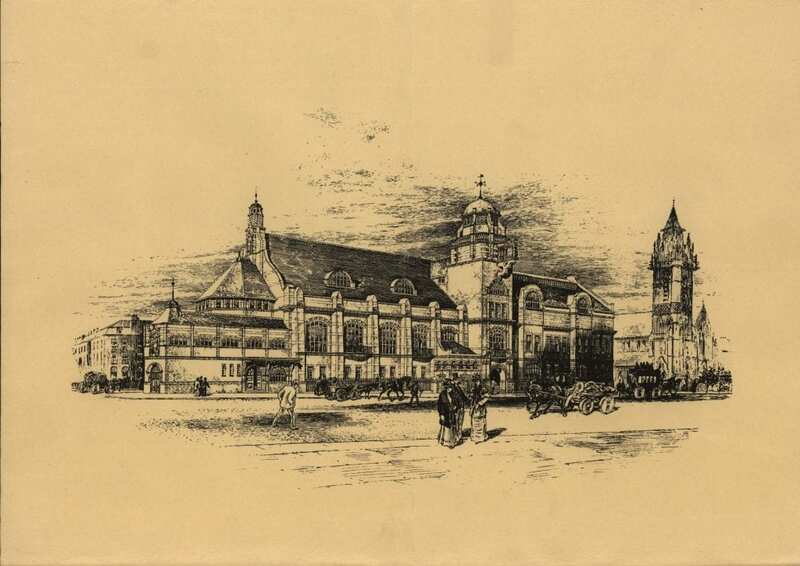 One of the most prominent examples of City’s heritage is its original home, the 1894 building designed by Edward William Mountford, now known as College Building. Although several areas of the original nineteenth-century design have been modified over the years, much of the original fabric remains. This includes the prominent clock tower, whose bell still chimes hourly. In the exhibition, you’ll see the architect’s impression of the building as it originally looked, described by Sir Nikolaus Pevsner as “an exceedingly successful example of the neo-French sixteenth-century style [with] fresh and playful enrichments.” Plans and documents relating to the construction of the building are also included. 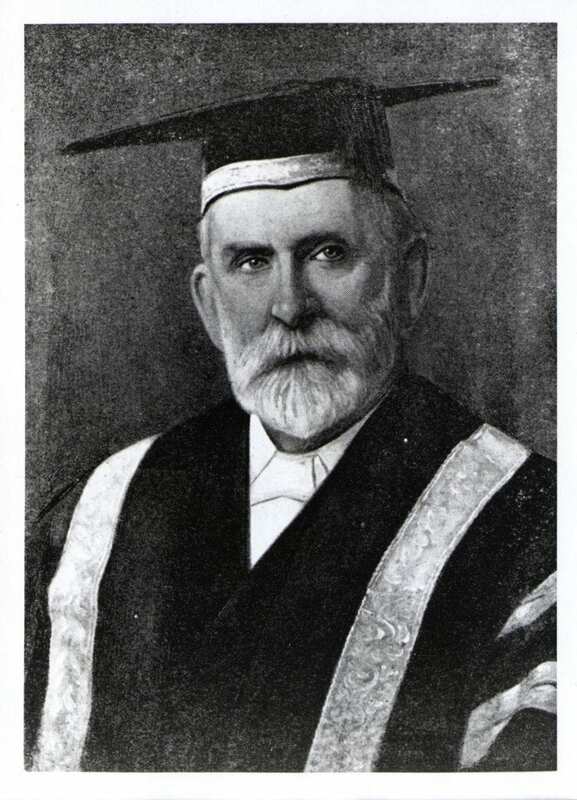 The first person charged with delivering this aim was the Institute’s first Principal, Dr Robert Mullineux Walmsley. Walmsley acted as president of the Institute for almost thirty years, from 1895 until his death in 1924. The exhibition includes several hand-written letters of commendation from his colleagues, that were submitted at the time of his application for the position. 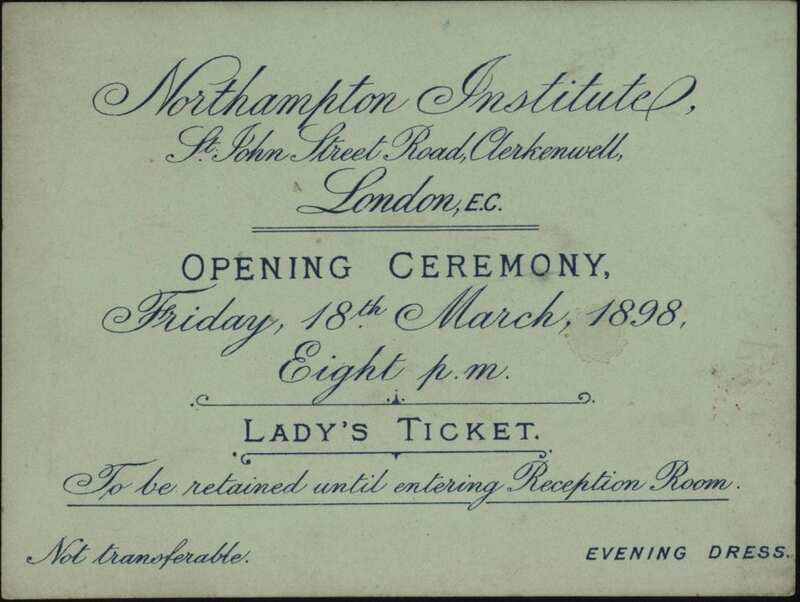 One of Walmsley’s first acts as director was to oversee the official opening, on 18th March 1898. This was a grand affair, attended by the Lord Mayor of London and the Lady Mayoress, as well as the Sheriffs of the City of London. Original tickets from the event can be seen at the current exhibition, together with an original programme of music. 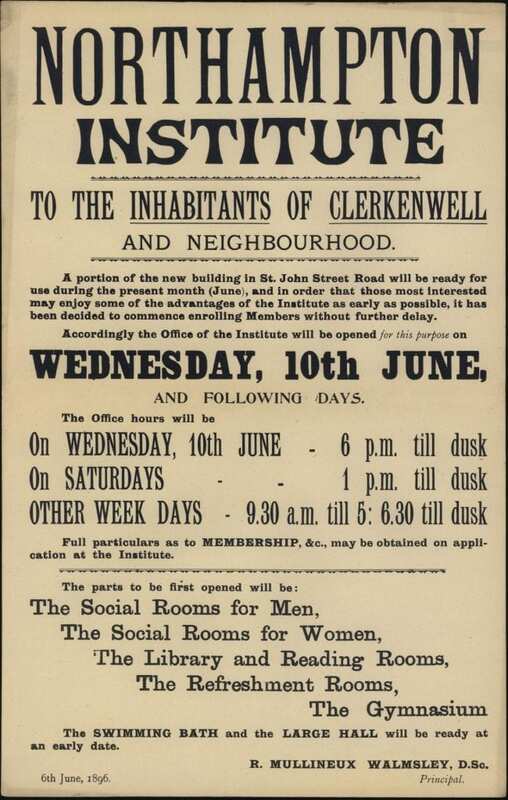 The exhibition also contains a poster advertising the public opening of the Institute to Clerkenwell residents, and images of some of the spaces that were open to local people. The exhibition is located at the foot of the Grand Staircase, on the ground floor of the Pavilion, University Building. Step-free access is available from the main entrance, on Northampton Square. Admission is free and you can visit whenever the University reception is open. You can also view photographs and information from the exhibition on the City125 microsite. If you have any questions about the exhibition, you can contact the CityLibrary Archives team.